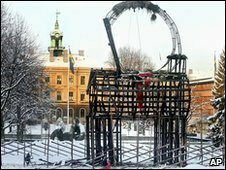 A giant straw goat - the traditional Scandinavian yuletide symbol - erected each Christmas in a Swedish town has been burned to the ground yet again. The goat was set alight in the early hours of Wednesday morning in the city north of Stockholm. City spokeswoman Anna Ostman said the incident, which is being treated as serious vandalism, was "sad". "We had really hoped that he would survive Christmas and New Year's," she said. As well as being burnt, the goat has over the years faced other acts of vandalism including being run over by a car, having its legs removed and being smashed. After some experimentation, city officials decided not to spray the straw-covered wooden structure with fire-proofing chemicals as this discoloured the straw, making it "look like a brown terrier instead of a yellow straw goat" Ms Ostman said. The city's website offers a bilingual blog and Twitter feed, as well as webcams to allow fans to follow the beleaguered goat's fate. In one of its last entries, the goat writes: "Terrible night! Slept so well under my beautiful snow blanket, when it suddenly became awfully hot. It was fire!!! At 0300 someone managed to set me on fire and destroy the amazing Christmas spirit in Gavle." Just 10 of Gavle's goats, built in the town's central square, have survived beyond Christmas since 1966. Most have been burned, sometimes within hours of being erected in the first week of December. The culprits are seldom caught. However, a 51-year-old American tourist spent 18 days in jail after being convicted of setting it alight in December 2001.